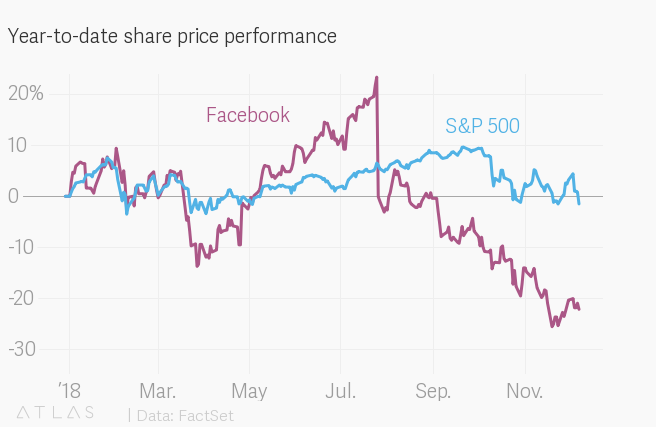 The social media giant’s shares have fallen nearly 40% since late July, hit by a steady stream of bad news that includes, but is not limited to, failing to act against Russia’s attempts to influence the 2016 US presidential election; letting the site play a role in stoking ethnic and religious violence in several countries, including Myanmar; allowing advertisers to target users according to categories like “Jew haters”; selectively trading data with other companies to favor partners and punish rivals; and denying and deflecting attention when these various scandals first came to light. And then there’s the general public angst about social media and smartphones harming the mental health of a generation of kids (and their parents, too). As of the third quarter, the company had some $41 billion of cash on tap, so it has the resources to buy plenty more stock if it felt so inclined. The buyback announcement gave the stock a bit of a bump in after-hours trading on Friday (Dec. 7), but the company’s shares are still down by around 20% so far this year, valuing the company at around $390 billion.